I wanted to tell you about our 2012 winter in South America, but time is slipping away. It is only five or six weeks before we begin our migration home. It is hard to communicate telepathically during the flight. I’m not complaining but, well, you should try it sometime. I hope the Doctor has described to you, at least the basics, of migration. If not, I’ll have something to say to him when I get home. Poor Ozzie, I thought he was going to have a stroke last year, when the channel maker disappeared. Did Master Bridge player Emily Vaughn tell you what really happened to The Red Channel marker? If not, ask her. She will tell you about Occam’s razor* and the Fermi paradox. * If she will not tell, ask me. Sometimes it takes a bird to understand. I wondered if Ozzie would use last year’s “living in a tree” nest site this year. You know Reggie Raccoon scared me terribly last summer and I really don’t want to be anywhere near that area. I doubted he would, as Ozzie is a smart bird and very thoughtful. I hoped he would be thinking about me when he got home to the North River. It is hard to suppress a smile at this point in the story. You will smile too, when you know what I hoped Ozzie would find. I knew something that Ozzie did not. And what a surprise I hoped it would be for him! The Doctor and I had been keeping in touch throughout the winter and I knew what he was up to. What a sweet guy. The story is a long, but it is a good one. Where to begin? Other humans, including the one he lives with, consider the Doctor incompetent when it comes to any kind of carpentry and/or handyman work. I saw him trying to change a windshield wiper blade once. There was the time the garden hose froze and broke in half, then the dog dug a hole under the fence, and the garage door got stuck. Once he nailed a new brass scroll plant bracket to the back porch. It fell off mid-summer when his granddaughter, Molly, touched it. She began to cry, thinking she had broken it. Do you know the potato technique, if a light bulb breaks off it its socket? I don’t want to embarrass him, but candidly, the Doctor seems to lack his share of innate, practical, dexterousness, and has little aptitude for mechanically transforming thoughts into structure. So, the human that lives with him was surprised when the Doctor announced he planned to build an osprey nesting platform for us. Every day after work The Doctor retired to his home office and thought about what he might build. He was thinking of a structure with bold line, earthy tone and coarse texture. He wanted a geometric shape, but not too angular; large enough for the two of us, and hopefully chicks, but also intimate and cozy. The focal point would be 16.25 feet above the low watermark, so one’s eye could take in the constantly changing river background without disturbing the negative space within the structure. Here are some preliminary sketches. 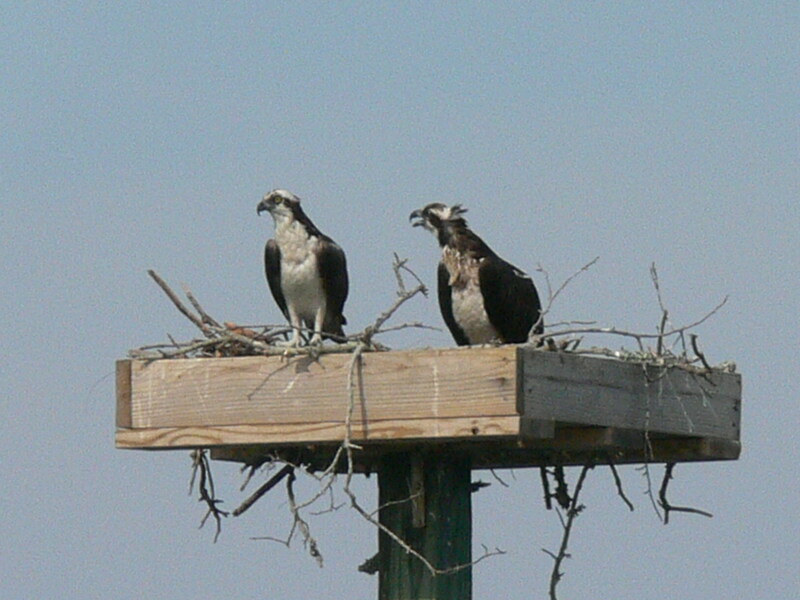 One of his neighbors claimed he had to have a permit to build an osprey platform. This really annoyed the Doctor. He knew we needed a better site than that Old Black Locus Tree. Another neighbor said, “Well, you don’t need no stinking permit to build a duck blind!”, so our new home, under construction was called an “open air duck blind” for a long time. The platform plans lay on his desk for two weeks. Each day after work he stared at them and shook his head. The practicality of the project began to worry him. He would have to buy a saw, and a drill, and some nails and screws, and maybe even some bolts or something. These are things that make him nervous and insecure. “I really don’t know how to build things”, he mumbled to himself. “What the hell is a 4 x 6”? “What does plumb mean”? What is meant by “treated” lumber? How tall should it be? What dimensions? Stainless steal, galvanized, iron, copper, zinc? What are they talking about? “Maybe I should not be doing this”, he questioned himself. Design and redesign consumed his thoughts for a month. By the end of January, the plans were complete. The final design came to him in a flash; it was an undeserved gift from The Muses. Deep in sleep perfection revealed itself as a work of art; a cultural symbol, unique in style, aesthetically pure and naturalistically real. Notice the way the elements of structure are composed within the image. See how the basic concepts and fundamentals of nature give it stability. Now look at the composition. See how it represents the variety of unity. That was the key; variety and unity, but how to combine these opposites? The answer is of course: create variety but keep the variety confined to being unified. It was an epiphany and he knew it. The Doctor was pleased. He reviewed the final plan one last time. It was perfect. Perfect in unnatural balance, proportion, harmony, rhythm, and non-movement. “If I can create this structure”, the thought. “It will be the crowning achievement of my current life cycle”. This entry was posted in Ospreys and tagged Doctor, Poor Ozzie, the Doctor. Bookmark the permalink.